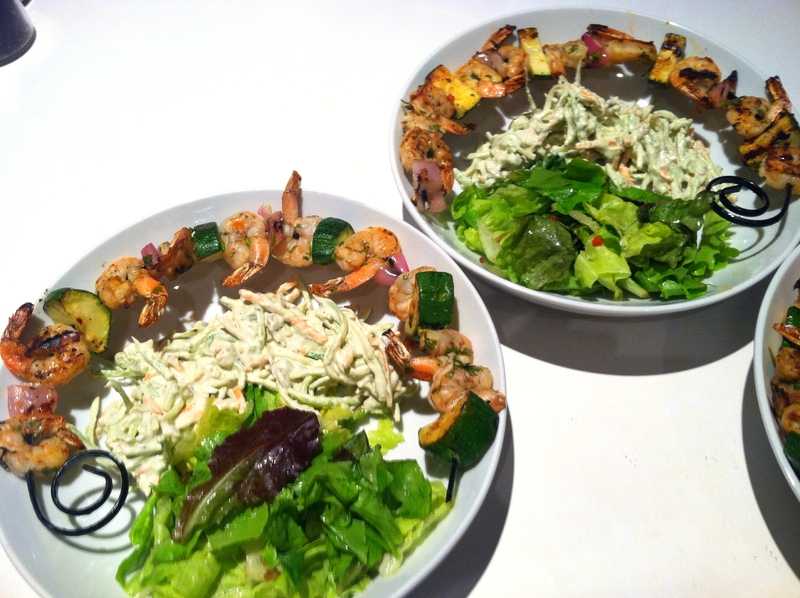 CSA 4 + lime cilantro shrimp – ugly food tastes better. I haven’t been feeling well (think I am having some phantom gall bladder issues) so I have been being really simple and healthy with my meals this week, so this might be a bit boring for some of you, but I enjoyed it! Originally I was just going to have skewers and salad, but then Danielle came home and made her amazing raw vegan broccoli slaw and I couldn’t resist adding some to my bowlplate. This is a nice recipe too because the easy marinade is also the salad dressing, cause that’s how I do. Efficiency first. I bought supercool circle kebab skewers since I am evidently obsessed with kebabs this summer, and have a hatred of disposable things. They are great because the metal heats up to help cook the food evenly, plus they look cool and fit in bowls and on plates. 2 lbs medium size shrimp, tail on, cleaned well. Whisk together the marinade and take 3/4 of it to soak the shrimp and veggies and then skewer them. The lime juice will start to cook the shrimp so work fast! Then grill the skewers for a couple minutes on each side. Toss your greens with your remaining marinade and plate. Ding. Dinner’s done. This was also our work week for the CSA and whenever you have a farm stand shift you get all the extra food at the end. So our share is abnormally large, so get jealous, but not too much. We earn it. Is that not the largest stalk of rhubarb you have ever seen? Or zucchini? Or scallions for that matter!? Could there be more blueberries in my life? Love it. Wow! 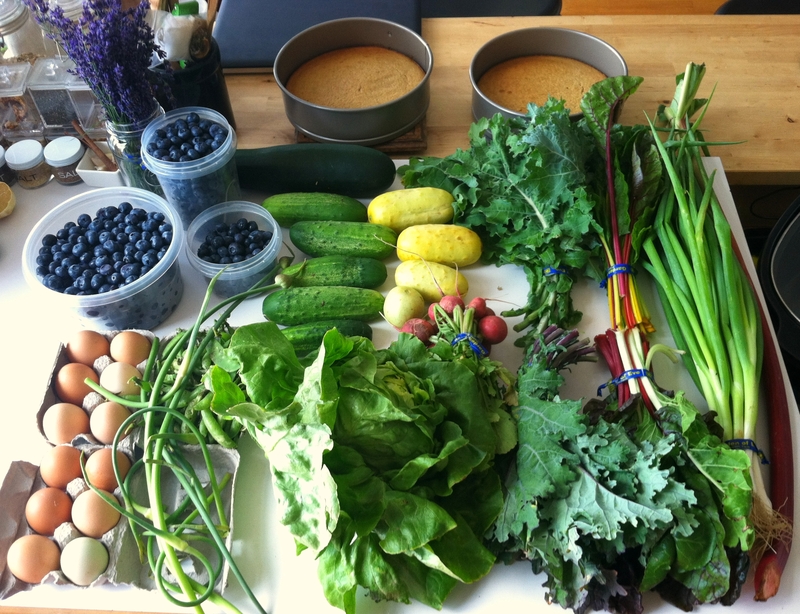 Holy cow, what an amazing CSA! And those shrimp skewers look delicious. Great haul! 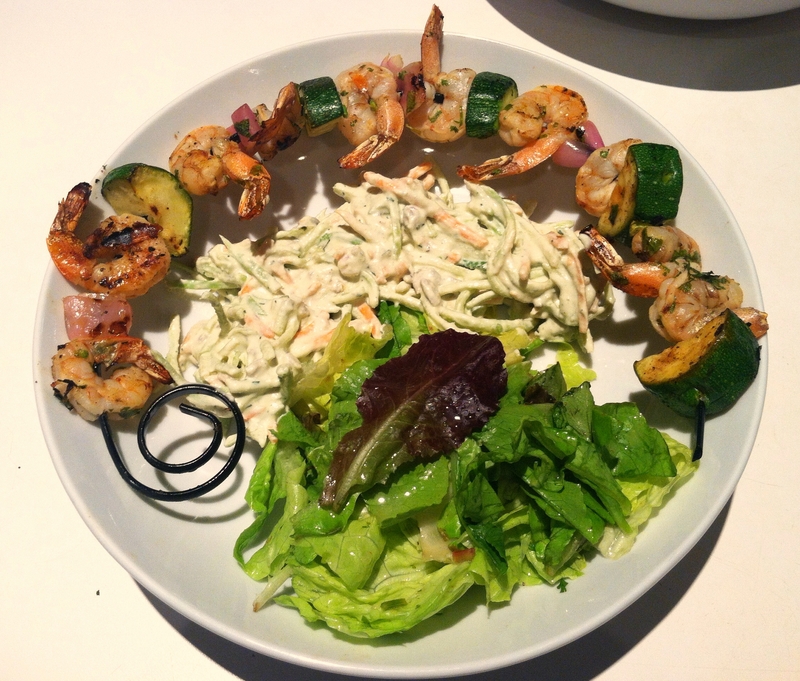 The meal looks very visually appealing as well as sounds perfect for summer. Girl you know it! I am making a honeysuckle tres leches with cake sprinkles and debating a berry topping…thoughts? Yum! your plates look amazing! I’m sorry to hear that you haven’t been feeling well lately. Hopefully by the time that you read this, you are feeling better. I must say though that you make the absolute most delicious looking healthy food that I have ever seen. This looks delicious! And those skewers are beyond cool! Deliciously healthy is the only way I will actually do it! See you Sunday! Looking forward to it! See you Sunday!